Join CS magazine, Choose Chicago, the Illinois Restaurant Association and the James Beard Foundation for the ultimate culinary celebration on April 17, 2017! Over 300 Chicago foodies, tastemakers and influencers. Tastings from 20 select Chicago restaurants. And one culinary legend — James Beard — who inspired not only this celebratory event, but also James Beard Eats Week and the James Beard Awards, known amongst the industry as the "Oscars of the food world." This is your invitation to join in on the fun! 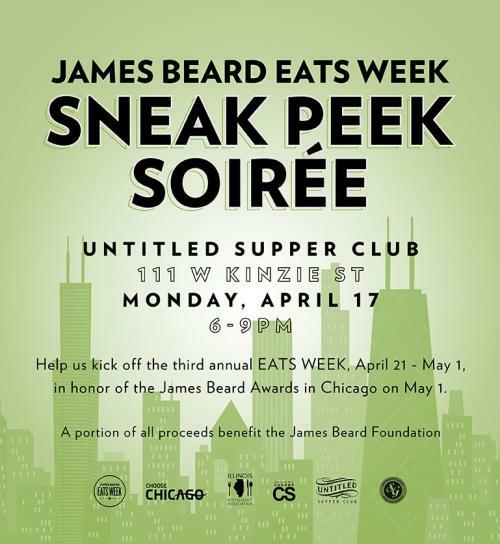 Sneak Peek Soiree — brought to you by CS magazine, Choose Chicago and the Illinois Restaurant Association — welcomes you to Untitled Supper Club on April 21, 2017 for a night of great eats and fantastic company. And all for an incredible cause, the James Beard Foundation. Read on for 10 reasons to add this soiree to your calendar, and BUY TICKETS today! Culinary connoisseurs, food critics and those who just enjoying cooking, explore dishes and unique pairings that are inspired by American chef James Beard. Have you ever wanted to meet a Chef from one of your favorite restaurants? Now you can! At Sneak Peek Soiree, each restaurant brings their Executive Chef to talk to guests about the dish, the inspiration and any culinary questions you can think of. In honor of James Beard and all things delicious, Chicago foodies can mix and mingle not only with one another, but with top influencers in the industry that has made Chicago a culinary destination. Rub elbows with the culinary elite to see what seasonal ingredients and creative dish stylings will be used this Spring and Summer. In a world of social media, come out to taste and take photos of all of the beautifully prepared food at Sneak Peek Soiree. There will be 15-20 different restaurants featured, so get ready for some fun new content for your Instagram feed! You didn&apos;t think there was only food, did you? The kick-off party will have everything from a photo booth, DJ, fun interactive elements... such as a juice bar, ice sculptures and a lounge area for guests to enjoy the evening. Concept art meets food at Sneak Peek Soiree this year. Columbia Student, Bryant Woodson II, whose styling work has been featured in Vogue Italia and Adreain Guillory will be creating full garments out of cabbage, kale, radishes, brussels sprouts...and more. Are you really going to dread a Monday if you are going to an amazing party? Keep the weekend going and head out for Monday Funday to kick the week off right. Looking for a fun date night? This is the perfect event to grab your significant other and have dinner while being experiential and interactive with the activations at Untitled Supper Club. And finally... reason number 10. You will not, under any circumstances, leave hungry. Visit choosechicago.com/jbf for more on James Beard Eats Week and to learn about the James Beard Awards (May 1, 2017) and the celebratory events leading up to it.